Cooking and fryer oil may be taken to the San Joaquin Household Hazardous Waste Facility, the Lovelace Transfer Station, or North County Recycling Center for recycling. Limit 5 gallons per customer. If you have larger quantities, please call (209) 468-3066 to make arrangements. Do not pour used vegetable oil or cooking grease down your sink drain. Liquid oil can clog the drain and damage pipes in your home. 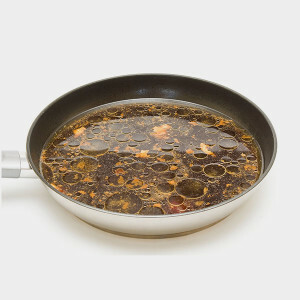 Do not dispose of hot cooking oil until it has cooled down. You can stick the pan in the freezer to speed up the process. Then, scrape the cooking oil into the trash. You can reuse cooking oil more than ten times. Simply filter out the food particles by straining the oil into a clean container. Many companies and cities are beginning to ask people to donate oil, grease and fat for the creation of biodiesel. Places all around the country have achieved success, from Hawaii to Louisiana, Pennsylvania and New York. The homebrew fuel movement has taken off, and biofuels are becoming a competitive fuel choice.